Proportion technique is a realm of “harmonic technique” that appears from the outside to be all numbers and formulae. In spite of this, it is one of the most lively domains, if one starts by understanding the concept of proportion = relationship in terms of its actual nature: an exceptional multitude of possible forms based on principles that are very simple because they are understandable, provable by anyone with basic knowledge, and not very mathematical. In this movement back and forth between numbers, the numbers change into distances and then into tones; thus every individual number, distance, or tone must always somehow agree with two, three, or more others, or else persuade these to agree with it. This process has a seductive charm for those who calculate, draw, and listen along with it; the reader should work over the examples once again and experience them. In this way, he will surely grasp their meaning himself. In §24a, we discussed proportions while considering “harmonic division-ratios” in the harmonic pencil of rays of the equal-tone lines. Unfortunately, the study of proportion is taught perfunctorily nowadays; textbooks usually devote only a few pages to it, and one wise writer thought that 3-4 pages “might be further abbreviated without repercussions” (Tropfke: Geschichte der Elementarmathematik, 1902, vol. I, p. 232). We shall see about that as we orient ourselves. This looks very dry. What do these formulae say? First, we will try to clarify them with lines. i.e. each element of the series is half the sum of its neighbors, e.g. Now, if we examine our diagram, we immediately notice that in the frequency diagrams, all horizontal rows of the overtone type clearly form continuous arithmetic proportions. This means that every overtone, in terms of its frequency, is half the sum of its two neighboring tones. In the string-length diagram, the “arithmetic” element is in the vertical series. 4 : 8 = 2 : 4 8 · 2 = 4 · 4 16 = 16 etc. x = √ab (geometric mean). The median geometric proportion between 2 numbers is the square root of the product of these numbers, which can be demonstrated with our diagram. If a = 3/2 and b = 2/3, then x2 = 3/2 · 2/3 = 1, thus x = 3/2 · 2/3 = √1 = 1. In the diagram, of course, we find other geometric proportions if we merely look for the ratios of equal intervals-for example: 4/2 c : 4/3 f = 2/4 c, : 3/4 g, where the equality-ratio consists of fifths. Here, as one can see, in contrast with arithmetic proportions, it is not the differences but the ratios of the differences that are equal to the ratios of the two pairs of section differences. It is now important and interesting to investigate the relationships of the three proportion types to one another. Viewed harmonically, Fig. 179 makes this relationship self-explanatory. In the P-diagram one can draw horizontal, vertical, and perpendicular lines through any point on the generator-tone line to find three intersecting “continuous” arithmetic, harmonic, and geometric proportions in each case-for example, the series through the point 8/8 c, as illustrated in Fig. 179. The great polarity of major and minor also once again emerges here: all major series (in terms of frequency, as in our diagram) have the arithmetic proportion as a constituent element in the background, and all minor series have the harmonic, whereas the geometric proportion invades them both from one direction and overshoots in the other, holding together the coordinate structure. For further investigations of the relationships of the three proportion types, their median proportionals are most useful. We find a remarkable conjunction in the circle (Fig. 180); here we also find the solution to the problem of the geometric construction of these three “median” proportionals. Thus VH must be the harmonic median. VG, the geometric median, results from the right triangle UGW, whose height GV, according to a well-known law of plane geometry, is equal to the square root of the product of the sections that it marks, a and b. Since, in Fig. 180, point V can be arbitrarily chosen, it is clear that only certain numbers are suited for an “emmelic” ratio of all three median proportionals. What was said in §24a.1 regarding the musical special case of “harmonic proportion” also applies here. We will soon see how the three “medians” relate to one another algebraically and harmonically. If we now pursue the two halves of this series to the right and left of √2 in the “P” system, we will see that these two halves, 3/2 5/3 9/5 ... and 3/3 3/5 5/9 ... each lie upon a straight line going out from 1/1-a very remarkable condition if we seek the possible “location” of √2, and even more significant if we examine the two end-values which these lines approach, or at which they also finish in the formula, namely α = 1 and ω = 2, as “limits” of these lines. The mathematically adept reader may investigate whether this is true! We can now operate a three-element continuous proportion with the third proportionals instead of with the median proportionals, to obtain new steps and values. For this proportion technique, which is often important for practical harmonic tasks, one should note the following scheme. (/10 - /9 - /8). Thus 25/3 cis is the desired third geometric proportional. In pure tones (without numbers) these are equal intervals, as noted above: i.e. the interval g-e is equal to the interval e-cis (minor thirds). Without arithmetic calculation, then, I could continue the example, saying that the further geometric proportionals to 10 e and 25/3 cis must be ais, since cis-ais is another minor third; and so on. which to our perception is a B-major (g-minor) scale for a generator-tone of 1/1 c. For the ancient Greeks, however, it was a “Dorian” scale, whose characteristic is that with c as the generator-tone, it begins a whole-tone lower and proceeds like a B-major scale, or with d as the generator-tone, it begins with c and proceeds like C-major. This, of course, only explains it in terms of today's very primitive perception of scales. For the ancient Greeks, and for those nowadays who truly understand “Gregorian chant,” these “church modes” are completely independent sound-forms with different psychical characteristics. Thimus then continues by differentiating the above proportioning further, and thus comes to a new elicitation of the so-called “enharmonics” of ancient Greek tone-systems that was lost, or at least no longer used, by the later Greeks (Aristoxenos, Ptolemy, etc. ): an exquisitely differentiated ratio-construction with deep speculative and symbolic significance. The reader who, armed with a beginner's background in algebra, calculates the above formulae, works through the proportions, and devotes himself to further related exercises, will certainly appreciate the deeper understanding of the laws of harmonic series-construction thus made possible, despite the apparent schoolbook-like circumstances. In a textbook, these things cannot be ignored. And those for whom such numbers and formulae are an expression of actual relationships, rather than just something external, will share the author's astonishment and wonder at the phenomenon of proportion itself, which is revealed in its innermost nature in the above examples. Especially in the last formula, the inner laws are perceived with redoubled effect. All other readers, though, who follow the suggestion in the preface and skip over the above pages, will be rewarded by the following ektypic excursions. In his later work Timaeus, Plato ascribes to Timaeus the following words on proportion: “two things cannot be rightly put together without a third; there must be some bond of union between them. And the fairest bond is that which makes the most complete fusion of itself and the things which it combines; and proportion is best adapted to effect such a union.”* And here a definition of geometric proportion is implied: “For whenever in any three numbers, whether cube or square, there is a mean, which is to the last term what the first term is to it; and again, when the mean is to the first term as the last term is to the mean-then the mean becoming first and last, and the first and last both becoming means, they will all of them of necessity come to be the same, and having become the same with one another will be all one.”** (Example: 2/3 f : 1/1 c : 3/2 g, and 1/1 c : 2/3 f = 3/2 g : 1/1). The fact that Plato described the unity of the geometric proportions playing around the generator-tone line as the “fairest bond” is in itself a proof for the “harmonics” of late Platonic thought, a proof that will be further solidified in the harmonic analysis of the scale of the Timaeus (§39). It is not claiming too much to refer to the phenomenon of ancient Greek thought and perception as a thought and perception in proportions, an ascendance of the spiritual (logos) to a harmonically conditioned interplay of sensuality, in which this proportional relationship (in Greek, in fact, the word for proportion is λόγος = Logos!) plays the role of psychically and spiritually saturated tectonics. It produces the most important intervallic building blocks: the octave, fifth, fourth, and whole-tone. The Greeks reached interesting conclusions from the discovery (or rediscovery) of the concept of proportion, only a few of which we can discuss here. Despite indications in the sources, E. Frank made the old mistake of viewing only the harmonic proportion as musically derivable. The ancients analyzed both the arithmetic and the geometric proportions harmonically, as we saw above; the latter, in fact, does not always need an irrational median or medians. In spite of this, it is indeed the irrational quantity √αω that, to a certain extent, controls and holds together the three harmonic proportions as beginning, end, and middle, and as a secret generating “ineffable” center. This conclusion, first made possible by harmonic analysis, contradicts the usual opinion of historians wishing to find, in the discovery of irrational numbers, an upheaval of the ancient worldview based only on rational numbers. The exact opposite is the case: the harmonic inclusion of the irrational numbers in the “cosmos” of the being-values arranged between the two infinities (1/∞-1/1-∞/1) strengthens ancient wisdom and perception in the presence of a universal harmony, precisely in that regulating power that grants the irrational numbers their value-emphasized place in the order of things. Of course, the discovery and teaching of proportional methods also had its practical significance. “For the Greeks, the inestimable value of proportions lay in the fact that they presented, with their metamorphoses, a substitute for our equations. 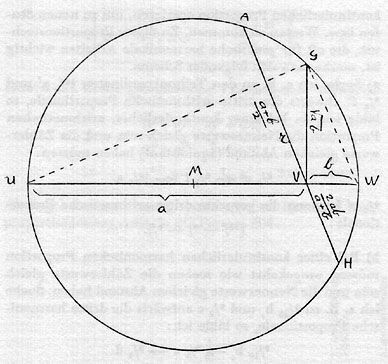 This important application explains the extensive treatment given to proportions by the Greek mathematician Euclid (ca. 300 BC), and also by Arabic and Medieval scholars. For a long time in the Middle Ages, and almost up to modern times, when letter notation was finally incorporated into equations, people continued to write the results in the form of proportions, which took the place of our modern closed formulae. Only in modern times has the space allotted to them been severely reduced” (Tropfke: Geschichte der Elementar-Mathematik, 1902, I, p. 232). From our harmonic viewpoint, we can only agree with these penetrating views. Unfortunately, Stenzel, like all previous philologists, knew only of the periphery of the harmonic backgrounds of Greek thought, and not of the center. The reader who has worked through harmonic fundamentals based on Thimus's studies and this textbook will find hardly anything more depressing than having to look over and work through the forest of often primitive commentary, laboring with insufficient acoustic tools in “dark” numeric-harmonic areas, especially on the fragments of Philolaus, the Pythagoreans in general, and the late philosophy of Plato. If one places all these ideas of the golden age of Greek philosophy upon the background of the concept of akróasis and its norms, its numerically precisely understandable and psychically perceivable laws-a procedure that is not at all arbitrary, but actually encouraged by hundreds of ancient sources-then this “refinement of sensuality,” which Stenzel very rightly detected in those ideas, will become graspable and understandable from a fully new, central position, inwardly adequate to this thought and accessible in the deeper sense to heart and mind. One then sees that Plato did not “come upon the unhappy [!] idea, in his old age, of developing the world of ideas as a number-system” (W. Windelband: Platon, 1905, p. 93). On the contrary, for Plato, number-harmonics was the bond joining idea and sensuality, and it was Windelband himself who came upon a very “unhappy idea.” In my essay on Pythagoras (in Abhandlungen), I attempted for the first time to rectify the most important Pythagorean theorems of akróasis, which indeed place the eye and ear on an equal level with thought. But a harmonic analysis of all Greek philosophy up to around Proclus would require half a life's work; this analysis requires a precise familiarity with the fundamentals of harmonics and an equally great knowledge of philosophical and natural history, supported by thorough language abilities. I am sure that whoever undertakes this project will achieve results that place all of the ancients' scientific, artistic, and philosophical thoughts and experiences upon a new, central foundation, not as seen by our modern thought but self-radiating from the cosmos of Greek thought. After this digression, we now return to our proportions and will note a few more typical examples for the ektypics of harmonic proportioning. The twelve sides, eight corners, and six faces of the cube form a harmonic proportion. Nicomachus and Iamblichus believed that on this basis, the ancients spoke of a ̔αρμωνία γεωμετρική (geometric harmony); because the octave (12 : 6 = 2 : 1), the fifth (12 : 8 = 3 : 2), and the fourth (8 : 6 = 4 : 3) are all present in the cube's ratios. As we saw in §24, geometry, through the significance of harmonic proportion, is anchored in harmonics especially on its projective side. 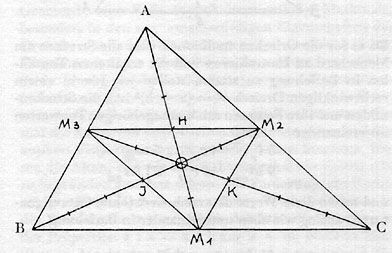 Clavius, in his commentary on Euclid, concentrates completely on a musical proportion, which emerges in a triangle M1 M2 M3 that bisects any triangle A B C and the corresponding segments on the connecting lines of the corner points and the bisection points (Fig. 206). Here I have written all possible proportions between one another, so that his example shows how the material of our partial-tone coordinates, albeit lacking thirds here, emerges from a very simple notation of various proportional possibilities, with an elementary geometric theorem well known to the ancients. The Pythagorean triangle, with sides 3, 4, and 5, yields a considerably richer psychic harvest. Since it was traditional for the Greeks to test all segments on the monochord and to set the tone-values obtained in relation to one another, we will set the segment-numbers and their squares together with the corresponding tone-values (since for a right triangle, c2 = a2 + b2). Unfortunately, the “second part” mentioned by Thimus, i.e. the third volume of his Harmonikale Symbolik, was never published, and so far the search for the supposedly existing manuscript has proved fruitless. The letter from Newton to Harington speaks for itself. If such a great spirit was not afraid to take number-harmonic investigations seriously, and indeed to direct his special attention to them, then this is a challenge and incentive for us today to give a new foundation to the whole field of harmonics and to draw the corresponding conclusions. Further on in the domain of elementary geometry, there is a wealth of typical harmonic features, especially in the so-called “curious properties of the triangle,” the sections determined by them, and so forth. This is actually expressed in the word “chordal” (from ̔η χορδή = the string), and “hypotenuse” (from ̔υποτείνω = to span, namely a string). 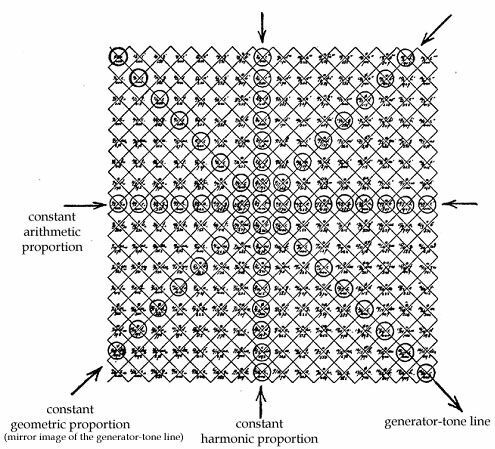 The beginnings of the function-concept and the seedlings of analytical geometry are also based on the ancient concept of proportion, whose innermost nature the ancients knew how to derive harmonically and substantiate, as we have seen. The formula for changing a rectangle into a square, which we write today as the formula x2 = ab, was expressed by the Greeks in the proportion a : x = x : b, etc. There is more on this in the textbooks on the history of mathematics cited in the bibliography for this chapter. It is highly interesting to note the sudden emergence of the imaginary number i when the two division ratios of a harmonically constructed segment are set equal. From all these examples, and those in §24, it is undoubtedly evident that seen historically, the fundamentals of the “new” projective geometry, the germ of the function-concept, analytical geometry, the concept of the infinite, the irrational, and the imaginary (the number i), are all based on a common denominator of the universal concept of proportion. The fact that the Greeks did not yet need our modern formulae makes no difference regarding the actual knowledge that they obviously possessed about these things. The common view of Greek thought is that it was directed only towards the finite, the “rational”; but for us, from the harmonic standpoint, the derivation and basing of all these very “modern” concepts upon that of harmonic proportion is of exceptional importance. This shows that the concept of the ratio in itself, which indeed is most distinctly characterized in the interval, has a constructive significance in the whole structure of mathematics. If we grasp the nature of proportion in the value-formal sense, as I tried to do in my Grundriß (p. 277ff. and 280ff.) under the value-forms of “ratio-equalization” and “being-proportion,” this meaning becomes almost universal. The reader should use his own knowledge and experience, and the parts of Grundriß just mentioned, to make up for the lack of space to discuss further ektypic examples here. The “golden section,” harmonically a third-sixth problem, was specially discussed in my Harmonia Plantarum, p. 148ff. In §29.1 and §55.8 we will discuss this further. From our human viewpoint, the concept of the “relationship” of humans to one another is nothing other than proportions of psychic individualities, whose “tones” must or should be tuned to one another so as to somehow satisfy the proportional relationship, not in a mathematical but in a value sense. Anyone who is comfortable in a circle of friends knows well enough how someone who does not belong in the circle “disturbs” it, which says nothing about the disturber as an autonomous being-value, but simply affirms the fact that the previously existing proportion is no longer in tune when a foreign element is introduced. But a thought that is new, unfamiliar, objectionable, also acts as a power in the previously existing spiritual proportion, and must either adjust to the existing elements (if it is too weak) or else, by the strength of its own value, rectify the other elements until they enter into a new proportion with it. The domains that emerge in a new light upon the background of harmonic proportions will be discussed later. The first, “harmonics and architecture,” will be the subject of the next chapter. The proportions of the human form will be brought into connection with the “sound-image” in §38, and proportional relationships in the planetary system will appear in §41 with the discussion of the Timaeus scale; further harmonic theorems must be discussed beforehand. A. von Thimus, Harmonikale Symbolik, preface x ff., I, 118ff., 196ff., II, 32ff. H. Kayser, Hörende Mensch, Ch. 2; Klang, 20, 21, 36, 37, 51-2, 142, 145; Grundriß, 103, 155, 287. On mathematical proportions, see the familiar textbooks. For a new discussion of Greek thoughts and perceptions from the standpoint of akróasis, indispensable initial literary tools are: 1) A. von Thimus, Harmonikale Symbolik; 2) Diels' Fragmente der Vorsokratiker; 3) Grundriß, vol. I; 4) E. Frank, Plato und die sogenannte Pythagoreer, 1923; 5) J. Stenzel, Zahl und Gestalt bei Plato und Aristoteles, 1924; and 6) the author's fundamentals of new harmonics compiled in his works, especially his essay on Pythagoras in Abhandlungen. Aristides Quintilianus's De Musica, fundamental for the entire “atmosphere” of Pythagorean musical philosophy, has been excellently translated into German by R. Schäfke (Berlin 1937). Regarding Frank, the first thing to observe is that the main value of his book is in its wealth of dates and references, and in the fundamentally correct assessment of harmonics in Greek thought. As far as I can see, even specialists reject his quirk of proving that the “so-called” (!) Pythagoreans were mythical. Stenzel's work is valuable as an excellent collection of sources; it also does justice through many subtle and deep thoughts to the assessment of the “harmonic” side of Plato's later philosophy in its numeric-spiritual aspect. But neither Frank nor Stenzel knew that this actually had a technical harmonic background, though Thimus had brought it to light long before them, and for these reasons they often labor vainly with certain things that a harmonic analysis could make very simple. But precisely for this reason, their books are more important for us harmonists; once one has studied through them, one often has the feeling that many false conclusions, incorrect interpretations, and misunderstandings in certain places can be rectified by the single concept of tone-number, not to mention the various harmonic theorems themselves, which often shed a brilliant light in the darkest places. But above all, the harmonically versed philologist should make a new foray into ancient mathematics, metrics, music theory, and natural philosophy. It seems to me that there is a wealth of harmonic relics here, in manuscripts or in published but little-known authors, with which history not yet known where to start, simply because no one has been able to arrange them into any “valid” science-and thus no one has been interested in them. * Plato, Timaeus, 31, tr. by Benjamin Jowett.